The Sovereign Ultima Hollowing System from Robert Sorby is a shielded cutter-type tool. It comes in two sizes, is part of the Sovereign tool system, and can be purchased with or without a handle. Both tools are identical in all but size. The medium Ultima has a 16mm (5/8in) diameter shaft and is 460mm (18in) in length, with the handle being 560mm (22in) in length - it can hollow to a depth of around 405mm (16in). The smaller tool has a 12mm (1/2in) diameter shaft and is 330mm (13in) in length, the handle being 405mm (16in), with a hollowing depth of around 280mm (11in). The depth of cut is governed by a micro adjustment wheel set behind the cutter cap. This cap has been designed so that around one third of the front edge of the cutter is exposed making hollowing that much easier, as the cutter assembly doesn't need to be moved to a new position all the time. 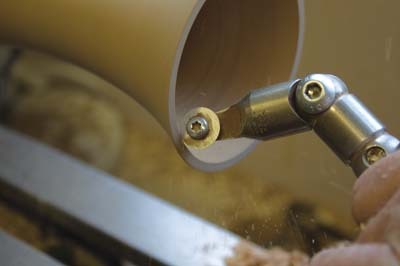 The internal throat of the cutter head has been designed so that shavings are ejected out of the top, so the cutter won't clog. The cutter itself looks like a small cone and is made from high speed steel. It can be moved several times before sharpening, which can be carried out in place with a diamond file, or with the cutter removed. The latter being easy to achieve with the supplied torx type wrench. The hollowing tool's cutter can then be placed in a cutter sharpening jig and sharpened with a diamond file or on a grinding wheel. 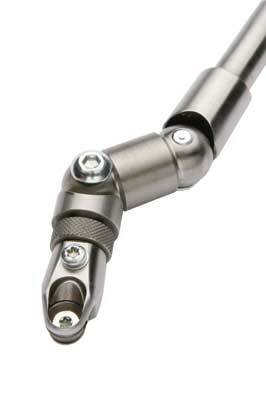 The cutter head is attached to the main shaft via an articulated link piece. The cutter and link assemblies on both sizes of tool are very well engineered, though this makes them quite chunky. This means hollowing through a very small opening is not possible â€“ no bad thing if you are new or inexperienced. The handles are made from seamless steel tube with a soft grip rubber coating. The end caps are made from aluminium to give the handle a balanced feel. The front cap will accept the 16mm (5/8in) shaft straight off, but two additional collars are included so 12mm (1/2in) and 10mm (3/8in) tools can be fitted, which is a real bonus. Steel inserts are screwed into the aluminium front cap and then the securing screws are fitted into these so the aluminium doesn't wear out. 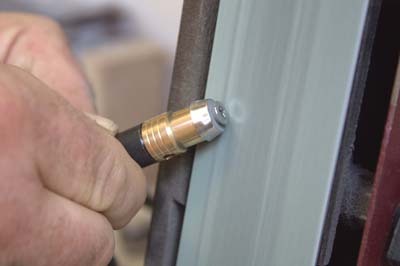 The securing screws have brass inserts in the ends so they don't damage the tool shafts. As a traditionalist, I usually go for wooden handles but I have to say that the Sovereign handles feel very comfortable and well balanced. Several accessories are also available: the cutter sharpening jig; spare cutters; and shear scraper heads for both sizes of Ultima; extra links for a more severe shoulder cut; and a side handle and a counter weight for deep hollowing. I found the system relatively easy to use. The toolrest height was set so that the Ultima cutter head was cutting on centre, and the cut was set reasonably fine to begin with. I first tried both tools on a vase 255mm (10in) long and 100mm (4in) in diameter, and turned out of a piece of unseasoned wet rowan. After drilling out the middle I started the hollowing with the small Ultima before trying the medium. This went extremely well for the first 75mm (3in) or so, and the shavings flew out of the top of the cutter head as advertised. However, as the hollowing progressed, chatter developed and the cutter heads blocked quickly. This I found to be my fault, as I wasn't stopping and clearing the shavings often enough and the cutter setting was too harsh. A small readjustment of the cutter cap using the fine adjustment wheel, and clearing the shavings more often, soon sorted the problem. I then tried the small Ultima on well seasoned and dry English oak (Quercus robur) 75mm (3in) in diameter and 125mm (5in) long. This time I found the hollowing a lot harder and I did experience slightly more chatter with the small Ultima due to the oak's hardness, tool overhang and the smaller shaft diameter. I readjusted the cutter for a fresh, sharp edge and a finer cut; with these adjustments the hollowing was soon complete. 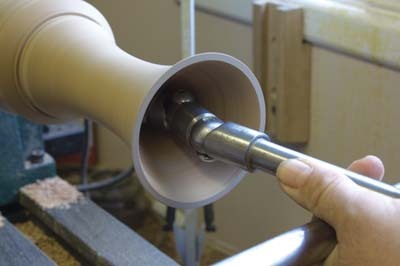 To finish the inside of the hollow form I then turned to the shear scraper head accessory, attached in place of the cutter head assembly. This accessory is a must as it soon made short work of any ripples and unevenness. Next I tried the cutter sharpening jig. 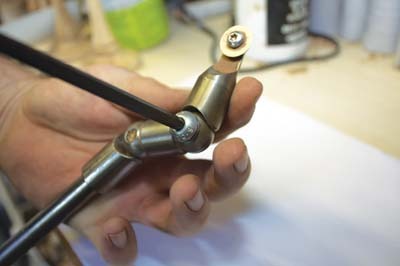 This jig is a brass shaft - which the cutter is secured to - and a steel sleeve that the shaft spins in. Sharpening was as easy as offering the jig up to my ProEdge and letting the jig/cutter spin round and sharpen - this would be just as easy on a grinding wheel. My last test was on an enclosed, hollow form side grain project turned from walnut (Juglans regia) measuring 140mm (5 1/2in) in diameter and 63mm (2 1/2in) deep. To see how small a hole I could hollow through, I started with a 38mm (1 1/2in) hole and drilled out the centre to within 3mm (1/8in) of the finished bottom. For this hollowing I used the small Ultima exclusively. The cutting of the side grain was extremely easy, but I soon found that for hollowing out under the shoulder, the original hole was too small. So, I opened up the hole to 50mm (2in) and fitted the extra articulated link: this allowed me to hollow out more timber under the shoulder, but still left a lip of timber around the neck of the hollow form. This, however, wasn't due to the chunky nature of the cutter head and links, but due to the actual length of the cutter head assembly â€“ being 63mm (2 1/2in) long - and the fact that the cutter doesn't cut right on the side of its head.To overcome this - what I think is the tool's only shortcoming â€“ I swapped the cutter assembly for the scraper head: this not only cleaned up the inside of the hollow form, but meant I was also able to remove the lip around the inside of the neck. I found that using the scraper on side grain needs a very light touch, as I had a surprise catch when cleaning up the bottom. Both sizes of Ultima Hollowing Tool worked extremely well. They are made in Sheffield and are well designed, built, and relatively easy to use. If you are in the market for a hollowing tool, either as a first timer or as an addition to your tool set, you could do no better. They are reasonably priced, very versatile and lots of accessories can be bought. I must admit that my first impressions of the tool were what big bulky articulated sections it has. 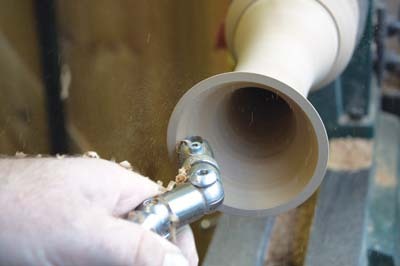 This will mean that you cannot cut a hollow form through a small hole - actually, very few people do. The construction method of the jointed sections - there is a shoulder at the joining section between shaft and joints - means that if you use all the front sections then the tip is quite a long way from the section of the thinner shaft that is on the toolrest. In truth, this is not a problem. You just use the amount of sections necessary to the reach you need in order to get to the area to be cut. But remember, as with all hollowing tools, keep the tip as close in line with the main shaft as possible, which will afford you optimum control. The knuckles lock down beautifully with no movement. The tool is well made and robust. The micro cutter depth adjuster is easy and responsive to use. The blade will allow cuts from about the 9.30 through to the 2 o clock cutter position, if you view the cutter as a clock. Hogging and refining cuts are easy to make. The tool works very well on wet and dry end grain timber, and is good on the side grain sycamore and maple I tried it on. All in all, this is a nice addition to the other hollowing tools in the range.